Rudolf Fischer studied physics and mathematics in Cologne. With a thesis prepared at the Max-Planck-Institute for Astrophysics in Garching he received a PhD from the Technical University of Munich. After one more year as a post-doc he moved to the Computing Centre of the University of Stuttgart, providing user-support in supercomputing. Switching to industry he worked for Cray and NEC in the supercomputing market. While initially focussing on technical and in particular benchmarking work, afterwards he has held several management positions within the NEC Deutschland GmbH with increasing strategic responsibilities. 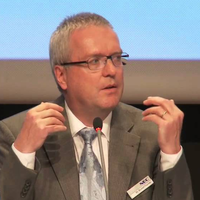 His current position is “Director Core Technology” of the NEC Deutschland GmbH, HPCE division, which is the European NEC organisation dedicated to HPC solutions.